Termites: Termites are the most destructive species in North America. It is estimated that termites cause more than five billion dollars of damage each year in North America. Keep in mind that insurance will not cover termite damage of your home. It is best to catch on to an infestation as soon as possible. Unlike ants, termites consume wood (cellulose), without it, a colony will not survive. They work 24/7 to establish their colony, and in doing so, may result to serious damage to your home. There are three types of termites in North America: Drywood Termites, Dampwood Termites and Subterranean Termites. The subterranean termites are the most common species found in Windsor and Essex county Ontario. We have found these termites in Tecumseh, Lakeshore, Amherstburg, Kingsville, Harrow, Leamington an Windsor. ​Subterranean Termites: These termites build and form their colonies underground and form tunnels/trails to their food sources above ground. A colony has several classifications of termites that all have their own job to do. The types of classifications are called castes there are five: nymph, worker, soldier, secondary reproductive and primary reproductive. The worker caste is known to make up of 90% of the colony. Their job is to seek out wood/food sources and build and excavate tunnels. They create tunnels and seal up areas excavated in the wood to prevent loss of humidity. Worker termites are also responsible for sharing food with other members of the colony, this process is known as trophallaxis. The soldier termites are responsible to defend the colony from attacks by predators such as ants. Their large shaped head and mandibles allow them to do this. Soldiers will generally account for up to 2-3% of a colony. The secondary reproductive caste is responsible to carry out extensive egg laying to help the queen establish and grow the colony. Primary reproductives consist of the queen, king and alates, which are swammers that search for new areas to start a new colony. Once the alates mate, the queen and king will find a ideal nesting site and begin forming a new colony. The queen will then become immobilized only able to perform the task of laying eggs. On a single day, the queen is capable of laying between 250 - 300 eggs. The queen is able to detect if a member of a certain caste is needed in the colony, the queen is then able to develop newborns that will work in that caste. For example, if more members of the soldier caste are needed, the queen will pick up on a pheromone and lay eggs to develop soldiers. As long as all castes are able to complete their job, the termite colony will prosper and grow. Size of colony: Termite colonies in Ontario can cover an area of up to 2500 square meters and contain as much as 4.5 million termites. Our goal is to interfere with the colony, eliminate all castes thus eliminating the colony from your home or business. - Avoid wood and soil contact of construction of your home. The structures of homes and other wooden materials found in a home can be a great source for a termite colony, make sure it is not rotted and does not make direct contact with the soil. Hollow block construction: Hollow block walls can provide easy access to termites. This construction can be used in crawl spaces, slabs or in this picture, a basement wall. Termites can enter through the voids of the hollow blocks and locate and gain access to the wooden structure. This can cause termite infestations to go unnoticed since the hollow blocks surround the areas where the termite tunnels are found. Treatment would consist of drilling into the wall voids and inject product to stop and prevent termite activity. Although this may sound invasive it is very minimal compared to what a termite infestation can cause. Solid poured concrete walls: Homes with walls and foundations with solid poured concrete are best for minimizing risk of a termite activity. However stress fractures, settlement cracks and expansion joints can allow termites to still access the structure of the house. 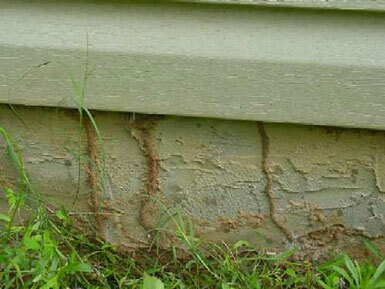 Homes On Slabs: Homes built on slabs tend to be easier to notice and identify termite activity. Since it is a home built on a solid concrete slab the only entry points for termites can be through settlement cracks, utility pipes and the exterior itself. In picture the left termites have managed to climb up past the slab and under the siding of the home, accessing the wooden structure. Treatment will be needed for the entire perimeter to stop and prevent future termite activity.